Georgia Kerkezis created a wheelchair-accessible community garden in Binghamton. Image Credit: Evan Henderson. Georgia Kerkezis created a wheelchair-accessible community garden in Binghamton. Photography: Evan Henderson. Georgia Kerkezis is sowing seeds for social change in her own community. Kerkezis, a junior studying environmental science with a minor in geography, used her Harpur Fellows’ grant to build a wheelchair-accessible community garden on the East Side of Binghamton, N.Y.
​The Harpur Fellows program, made possible by the support of Harpur alumni, provides students with the means to pursue a summer project that is not possible through an on-campus academic program. The other 2018 Harpur Fellows are Ramya Gopalakrishnan, Tiara Roy and Ifeoluwa Shoola. Kerkezis’ drive to help her community came from her work with Collegiate Professor Al Vos and the Hinman Public Service Learning Community. So Kerkezis contacted VINES − Volunteers Improving Neighborhood Environments, Inc. − and formulated her project based on its suggestions. But the garden that Kerkezis planned is more than just accessible: It’s also designed to alleviate the food desert on Binghamton’s East Side. Kerkezis’ garden is going to be built at 19 ½ Abbott Street and will charge $20-$25 for a growing plot for the full growing season. “VINES already has 12 gardens so this garden is going to be the 13th − they have an initiative to build 20 gardens by 2020,” Kerkezis said. 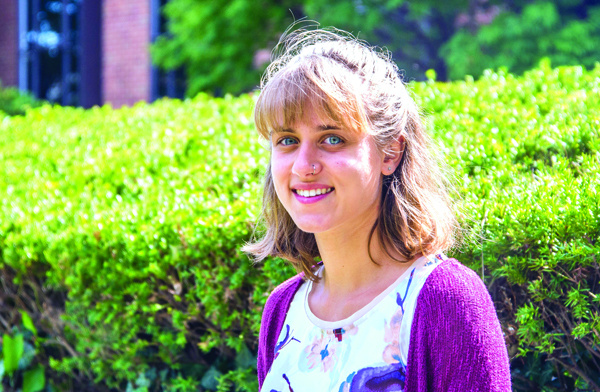 When planning her project, Kerkezis decided to stay in Binghamton because it allowed her to combine her own environmental knowledge with local resources, ultimately fulfilling one of the city’s needs. A big part of Kerkezis’ project was doing community outreach. Going door-to-door, Kerkezis recruited volunteers and found support for her project. Though the process was challenging at times, the affirmation she received from the University and the local community kept her motivated. “It was a huge learning process, because I didn’t think it would take as long as it did, but it was worth it − all of those intimate one-on-one conversations with people,” she said. Kerkezis was especially motivated by the excitement that the people in the area expressed. For Kerkezis, this project is bigger than just building a garden. “Another part of building the community gardens is bringing the community members together, getting them out of their houses and apartments to learn from each other and teach each other about gardening,” she said. Throughout the last three years, Kerkezis learned how to merge her community service projects with her environmental knowledge. By combining the two initiatives, she became interested in urban planning. Though she plans on extending her community outreach projects beyond the Southern Tier, Kerkezis will take the lessons she learned here with her.